I loved the illustrations and the words and the story, and my daughters seemed to love all of it. So, The Incredible Book Eating Boy by Oliver Jeffers instantly made our list of favorites. It’s a fun and slightly absurd story of a young boy named Henry who accidentally discovers that he likes to eat books. All kinds of books. And the more he eats, the smarter he gets. Until he eats too many, and things begin to get a bit jumbled and confused. Suddenly, it doesn’t seem like such a good idea to eat books anymore. This makes Henry sad, until he realizes that – rather than eating them – he could read them instead! And he finds that he enjoys reading them even more than he enjoyed eating them. Although, when you read it yourself you’ll see that sometimes, quite by accident, Henry still takes a bite or two … as evidenced by the big chomp taken out of the back cover. The gorgeous illustrations are so much fun. I find them to be delightful, as do my children, who scour the pages as I read. It’s definitely a book to be read by adults or older children, though, as it may be a bit too busy for emerging readers. But that’s the trade-off for the charm. It’s recommended for kids 4 and up, but my 3-year-old loves it and my 20-month-old enjoys it as well. They are both engaged during the story. It spurs conversations and questions with my preschooler and my toddler likes to point out different objects, like the red books that Henry favors. 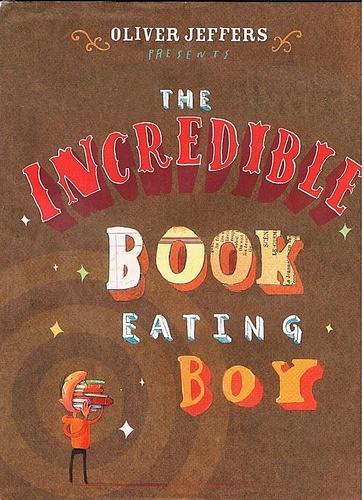 I completely recommend The Incredible Book Eating Boy.